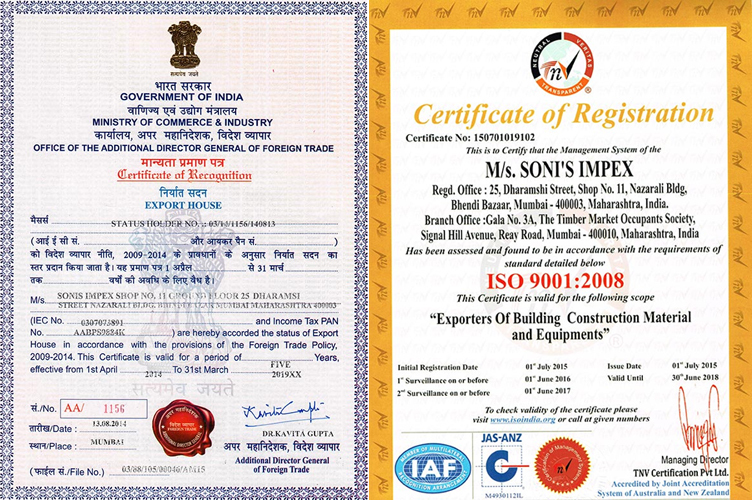 Sonis Impex is a customer-centric business organization that is carrying out business operations from the location of Mumbai (Maharashtra, India). Everything from quality checking to packaging and shipment is done by our reputed business entity without errors. Sourced line that includes Mild Steel Scaffolding, Reverse Drum Mixer, Vitrified Tile, Water Closet With Cistern and much more undergoes a wide series of quality checks prior getting delivered to customers. We keep a huge stock of offerings in order to suffice urgent requirements of diverse markets on time. Customers are kept updated from our end pertaining to any kind of change in delivery status. This keeps them assured about our loyalty towards them. Directorate General of Foreign Trade.